Size: H 12.4"x W(top) 15"/ W(bottom) 12.4"x D 4.9"x Strap 9.3"
Zipper closure keeps all your item safely. Large capacity, ideal size for carrying anything you need. Can be used as travel bag, bookbag, shopping bag, office bag, Beach bag, diaper bag. Dimension: H 12.4"x W(top) 15"/ W(bottom) 12.4"x D 4.9"x Strap 9.3" ,Large capacity to hold your stuff. 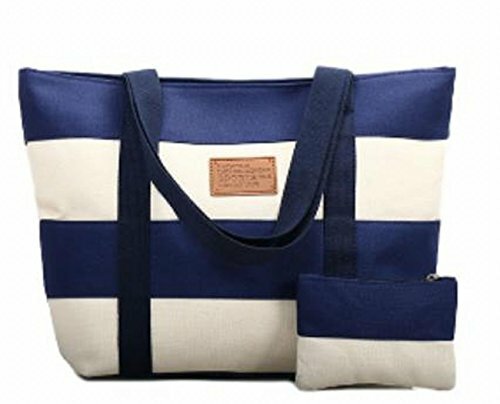 Durable Canvas Tote Bag- Delicately crafted with excellent Canvas, ultra soft and durable, perfectly highlights casual and fashionable style. Excellent stitching technic makes the tote bag more strong and sturdy. Casual Shoulder Bag with Small Purse- 1 Zipper main compartment; 1 inner pocket. Every bag includes complimentary small purse to hold coins, cards. Effectively keeps your daily supplies in order and makes you quick access, also say goodbye to mess. Large Capacity Handbag- Large capacity, durable and lightweight, perfect to hold A4 magazine, Mini iPad, Wallet, Mobile Phone, Powerbank, some Makeup, umbrella and other daily items. Fashion Women Purse- Stripe and classic design, can also be easily decorated and embellished. Nicely for full-time moms, middle/high school (bookbag, shoolbag),college,business trip, travel/vacation, office, walking, camping, dating or any other daily occasions, also a great choice for Thanksgiving & Christmas Gift idea. If you have any questions about this product by Gupiar, contact us by completing and submitting the form below. If you are looking for a specif part number, please include it with your message.